Are there any obvious distractions? Is it easy to find the information and navigate through the website? 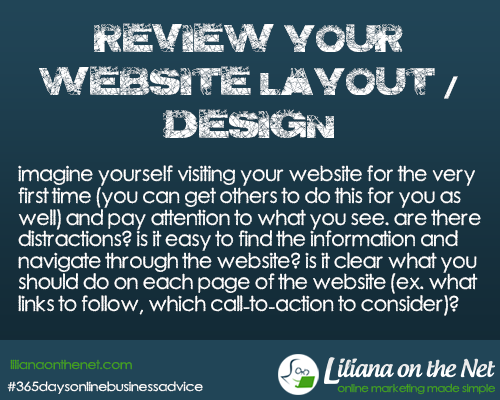 Is it clear what you should do on each page of the website (ex. what links to follow, which call-to-action to consider)? B) A website with hideous graphics and pictures that are not relevant. Fonts too fanciful or artsy. Visitors will be awestruck when visiting A and will want to leave as soon as possible when they visit B. We all know that people do judge by impression. Each person will differ but at least you will get plenty of ideas. Plain websites with great content will always win – it doesn’t need to be flashy. This website is still work in progress. Website design is an evolving “science”. I am concentrating in providing good content at the moment. I am evolving my website constantly. I only use three colors. I think, all of us start with a standard theme and then expand as necessary. Hence I find Genesis themes to be ideal as you can buy all the themes they ever produce for a certain fee or buy individual themes, all depends if you are planning to have more websites. I purchased all the themes and they have paid for themselves over time, as I have used them in a few offline corporate sites that we have. I also like Genesis, because if I need to alter something, I can always find a Genesis plugin, either released by Genesis itself, or by the community of users. I don’t need to wait for their support to answer me, although they do have a superior support desk. These themes are very popular and you can find a designer very easily on their forum to make any alterations you can dream of on the genesis engine. If you are planning to have a unique website designed for you, I would buy just the genesis theme and from the forum find the recommended designers. If you are like me, purchase all the themes and have logos and other graphics designed as I do. If you are planning to have just one blog, buy just one and the engine. They are very easy to change and there is specific code in the Genesis website for many alterations you can do yourself. When I first designed my site I started with a plan, but it was definitley a work in progress as I got it up and running. Not everything worked the way I originally thought it would. Great comment, there isn’t anything better than real life examples. I feel the same, I have to sort my categories yet. These are some really good tips. Thanks for sharing. Thank you for your comment and by adding your personal experience to the post. These are great tips!! I agree a clean, easy to use website is much more appealing then a fancy website that is too distracting! I think so as well. Mine is still work in progress but I will get there. I agree that website design is crucial to the success of a site. One of the things that always makes me shy away is I always assume website design is going to cost the big bucks and as a start up company, there is no money. I bought the themes years ago and now just pay for the graphics. I know about start ups, it is hard where to channel the limited resources first. Judging from the information here, I’m thinking I need to update my design. I never had a clear plan when I updated my last design but I’m sure I could create one with guidance from this post! I’ve just went to see your website and I am by no means an expert in website design but as a reviewer I would say. Your website design is sweet and appropriate for your niche. If I were looking for one constructive criticism, I would say I would take the background not to distract but nothing else. I haven’t really done much anything to my site. I’m so new with this blogging. But I am learning all the time. Hi Rachel, you have a very successful blog and I would be careful of changing too much. I would just change maybe the theme but leave the menus the same and the sidebar on the same side and the items on the sidebar on the same order as you might upset the readers. Sometimes I wonder if I should hire someone to design my website, but then I worry it wouldn’t be as personal as it could be. I just need to get into gear and change the design and colors I’ve been using for far too long! Hi, thanks for commenting. I had a look at your website and it is fresh, the only advice I would give you it is get rid of the background and make it plain. Again, just a constructive criticism. I noticed that backgrounds with pictures seem to be out. Perhaps someone would write about fashion on blog design. Great tips you have there! Genesis is a great framework, it helps me save a lot of time. I just started using it a while ago and it’s extremely helpful! I love Genesis. You can find so much in the net about it. Every web site needs a good call to action on their home page. You need to make it obvious what you what your readers to get out of your website. Yes we need to realise that our blogs are really the first impression we give to our readers. I choose designs that are simple and uncluttered. As of the moment, I do not have plans to change the look of my website. Thank you for sharing though, I would definitely take this into consideration when I get tired of my current design. Eileen recently posted…Create a Mark – Join #Markerly! I know and what I think is important, if you have a successful blog to make changes slowly or survey your readers. I am going through a website design my second site. Thanks for the valuable information. keep on posting.